St. Anne’s, Limehouse. Photo © David Secombe 2010. St. Anne’s, Limehouse, was built by Hawksmoor, 1712-30, one of his three churches in the East End which alone make a worthwhile pilgrimage: the other two are St. George in the East and Christ Church, Spitalfields. All were begun within a few years of each other. As early as the 1730s, overcrowding had become a characteristic of the East End, a process accelerated in the early 19th century by the building of the docks between 1800 and 1830, the demand for unskilled labour, and the arrival of Jews and other refugees from Eastern Europe. These three churches were built as necessities, but there is nothing utilitarian about them. Their originality continues to surprise us. Hawksmoor’s architecture, imbued with Baroque rhythms, is massive yet solid, like Johnson’s prose. Characteristic of how little we really value them is the fact that, at time of writing, Christ Church, Spitalfields, is under threat of demolition, though thousands of pounds are uselessly thrown away in every conceivable direction. Christ Church, Spitalfields, was not demolished and has in recent years been the beneficiary of grants to restore the fabric of the building after decades of neglect. Hawksmoor’s six London churches have experienced a revival in general, and have become talismans for those who seek to pursue a hidden or mystical history of the city. Peter Ackroyd’s 1985 novel Hawksmoor elaborates upon ideas proposed by Ian Sinclair that Hawksmoor’s churches map an Eye of Horus upon the capital, whilst Alan Moore’s graphic novel From Hell links the Jack the Ripper murders to the looming presence of Christ Church over Whitechapel. 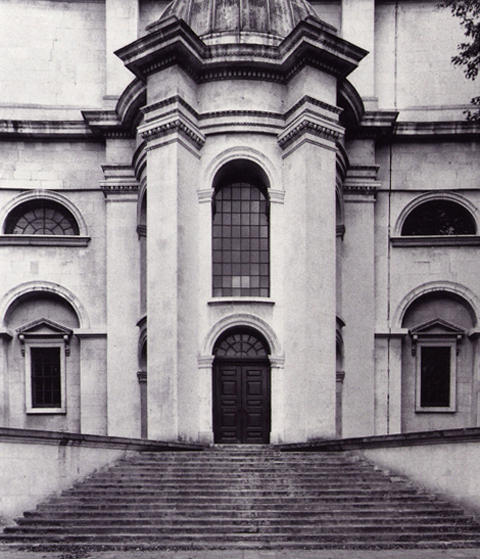 Psychogeography aside, the massiveness and intensity of Hawksmoor’s designs have a slightly forbidding quality– and his monumental East End churches must have appeared anomalous and strange to those living in the surrounding Georgian and Victorian slums. In the 21st century, however, Christ Church looks anomalous for a different reason: the deadly corporatised make-over of Spitalfields market has transformed the area into Covent Garden East, and Hawksmoor’s magnificent creation now looms over a retail theme park safe for hipsters and their friends.